In today’s world of nearly “instant” everything, we tend to drive decisions based on “gut feelings”, or simply in reaction to requests or directives. Too often we are forced to do this due to external forces we don’t control, regardless of the impact those decisions may have. This approach can derail our intentions to reach longer-term strategic objectives. 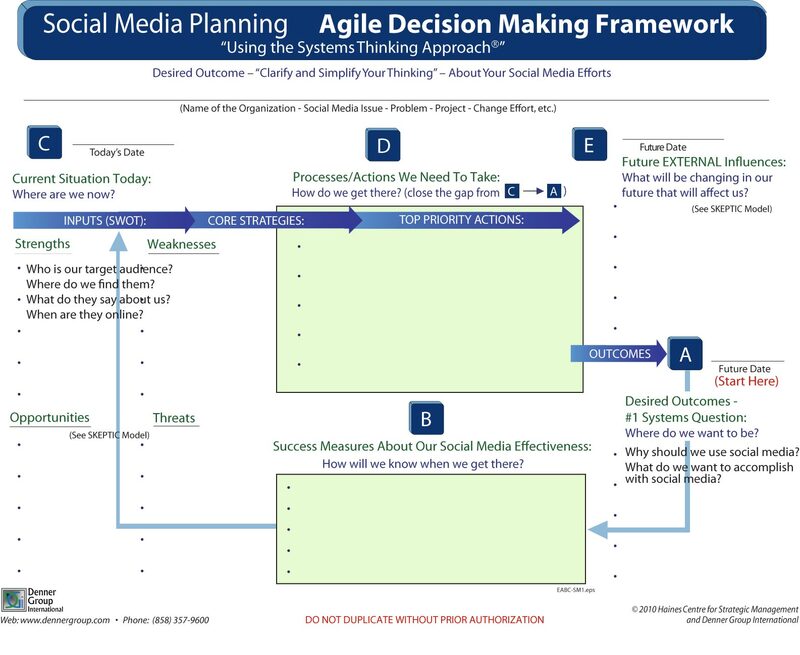 For example, the Agile Strategy Execution Framework presented by ASM.com mentions two key processes that help drive more “agility” into achieving strategic success. Those are “Sprint Decisions” and “Group Retrospectives”. Both of these processes utilize the collaboration of cross-functional groups in achieving their respective goals. It is valuable to note that ensuring the right type of “thinking” needs to be practiced throughout the framework model, and that means using “Systems Thinking”. This “systemic”, or “holistic”, approach to applying this framework is part of the “secret sauce” to being effective and successful in reaching your strategic objectives. If the term “Systems Thinking” sounds new to you, be assured it is not. Peter Drucker’s mentors in Vienna, Austria are considered to have shepherded Systems Thinking from the physical sciences into business management. Drucker then refined and articulated its applications. Many of the greatest organizations and businesses of today have been practicing Systems Thinking and teaching it for decades. For a brief overview, click here for an article about it. 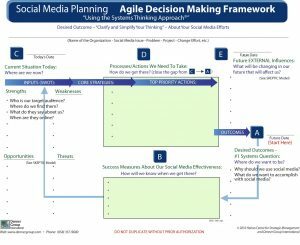 Both the “Sprint Decisions” and “Group Retrospectives” outlined by ASM.com can benefit from the organization and facilitation techniques drawn from General Electric’s “Work Out” concepts. Whether teams are working on problems in design, process, operational, behavioral or cultural issues, their solutions will be more clearly articulated, more effectively measured and adjusted to with greater agility. By working out issues in the collaborative, cross-functional teams, both deep dive activities and small bets can produce solutions that are better aligned with longer term objectives and create greater value for the customer and the business. A lean agile techniques we use is what we call “Sprint Workouts.” These cross-functional team meetings are half to one or two full days in length. The meetings are focused on specific outcomes and support at least one strategic initiative whose results can be measured and communicated quickly and effectively. The stakeholders are clearly identified prior to the meeting and informed of the intent of the Sprint Workout. This produces buy-in and stay-in for quick solutions. Creating and managing change is in the pressure cooker! The 2001 introduction of the “Agile Manifesto” by a consortium of thought leaders of the software development industry has now spilled over into nearly, if not all, aspects of managing organizations of all types. This includes strategic planning. First and foremost, let us accept that Strategic Planning is necessary and requires time, diligence and innovation. Nevertheless, there are tools you can use to make strategic planning agile, speeding up the planning process and achieving the same, and often better, results. Agile is one of those. Run your planning retreat in a manner that includes breaking into teams that operate in SCRUMS. The teams, each led by a facilitator, follow the iterative process in a very compressed time frame of 15 to 45 minutes (see SCRUMS) to achieve relatively small, discreet goals. These group collaborations, when facilitated using some key Lean Six Sigma tools, will more rapidly create the results you need in assembling your Strategic Plan. Apply Systems, or Strategic, Thinking rigorously to maintain an “outcome-based”, or “future-oriented” focus on the planning and implementation of the strategic initiatives. This ensures you concentrate your thought processes and behaviors on evaluating the entire organization as a “living system,” and includes considering the overall environment the business operates in. This helps to make strategic planning agile. Create the structures, processes and culture that ensure everyone in the organization understands their role in making the business a success. This may include deploying a proven tool, like the Agile Strategy Manager, that aids you in tracking, managing and adjusting your desired goals as everyone does their job to reach them. Use a proven framework for planning. It helps drive the use of a common language for communicating, following, measuring and managing plans throughout the organization. Applying Systems Thinking also ensures the outcomes you identify are creating value for your customer. And don’t forget the importance of providing your people with the best tools available to track and report progress. This also helps to make your strategic planning agile. Practicing “Agile” techniques, beginning with the Strategic Planning process, will permeate the Strategic Management process. Your organization’s various teams will implement the broader strategic initiatives and their respective tactical tasks. Keeping those tasks aligned with the organization’s strategic initiatives will help the teams adjust and innovate in a much more “Agile” manner. Celebrating your and your people’s successes will be so much more impactful when everyone realizes that being AGILE and COMPREHENSIVE are not mutually exclusive endeavors.